Any font contains thousands of characters, easy to find and use with Char Menu. Click the little grey box in the corner of the screen or press Ctrl-Option, and a window pops up with over 300 Unicode pages at your disposal to pick from, at a size sufficient to really see how they look. Click on any character, and it is sent to the current application like if it was typed on the keyboard. At the same time, it is copied to the clipboard. Char Menu is available to all applications, for instance Photoshop, where one may like to display characters not available from the keyboard. Char Menu lets you pick any font available in the system to see how a particular character will look. characters, languages, symbols, emojis, dingbats. One can also scroll through the available characters, or go page by page with left and right arrows. characters for it, they will be displayed. Then just click the word in. Unlike the built in systems that require double click, a single click sends the character directly to the app currently selected. So without any special setting, you can click in sentences in Arabic, Armenian, Corean, Farsi, Greek, Hebrew, Japanese, Russian, for instance. Even antique languages (you may need the fonts). Fonts generally contain semi graphics to create frames, lines, grey or black blocks, which can be used for all sorts of interesting effects. Even in pure and plain English text, it is nice to pick just the right kind of dot, just the right kind of em dash, or that special character that the regular keyboard does not provide. Think of Char Menu as a virtual keyboard on steroids. Instead of being limited to 60 or so different letters and symbols, you have access to several thousand glyphs encompassing all available languages and symbols, elaborate punctuation and accents, pictograms and unusual scripts. It has the same functional features as the complete, commercial app, except only Latin (ASCII) is enabled, but you can view all the pages. All questions, suggestions and insight are welcome. A lot of options are the direct result of users requests. To buy online with you credit card or Paypal account click the Buy Now button below. Instant download delivery for $3.99 only. The Lite version on the App Store does only copy, not insertion. 1 - When you click on the button "Buy now", it takes you to a payment page. Paypal is very safe, because we never have to know your credit card number. It is never stored on our site. When you transact, everything is encrypted, and cannot be intercepted. You do not need to open a Paypal account, and can pay directly with your credit card. 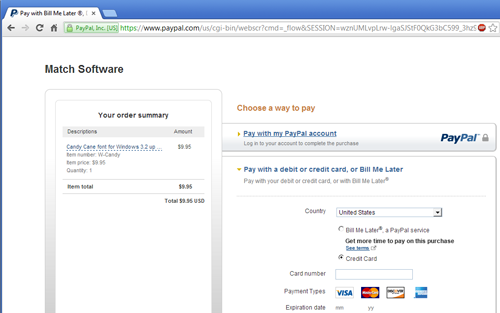 If you have a Paypal account, simply log in and click "Pay". 2 - Immediately after you are finished paying, Paypal will confirm the transaction on screen, and an email will be sent to you with all details. Make sure to wait for Paypal to take you back to our site. After 10 seconds, your download will start. Programs are delivered in a zip archive. Double click to open, then extract the familiar dmg virtual disk in which you find the app to drag in the Applications folder. We also send you an email containing all instructions in case you need to download again. If you still have questions, please feel free to send us an email. 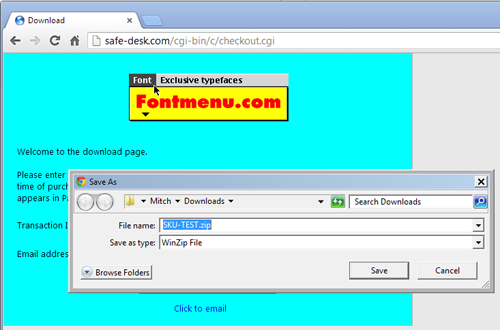 Disclaimer : Char Menu™, is trademark of Match Software and its owners. All other intellectual properties, such as copyright and trademarks, mentioned in this document, belong to their respective holders.